H. Pashler and M. Carrier, Structures, Processes, and the Flow of Information. C.M. Kelley and D.S. Lindsay, Conscious and Unconscious Forms of Memory. D.W. Massaro and G.R. Loftus, Sensory and Perceptual Storage: Data and Theory. L.A. Cooper and J.M. Lang, Imagery and Visual-Spatial Representations. H.L. Roediger, III, and M.J. Guynn, Retrieval Processes. M.C. Anderson and J.H. Neely, Interference and Inhibition in Memory Retrieval. F.N. Dempster, Distributing and Managing the Conditions of Encoding and Practice. F.S. Bellezza, Mnemonic Methods to Enhance Storage and Retrieval. D.A. Bors and C.M. MacLeod, Individual Differences in Memory. L.L. Light, Memory and Aging. C.C. Chandler and R.P. Fisher, Retrieval Processes and Witness Memory. A.F. Healy and G.P. Sinclair, The Long-Term Retention of Training and Instruction. Index. Authored by the foremost researchers in cognitive psychology, the handbook Memory is an outstanding reference tool for all cognitive psychologists and interested professionals. 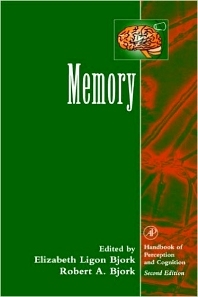 Memory provides an excellent synopsis of the research and literature in this field, including comprehensive chapters on basic theory. The text discusses storage and access of information in both short-term and long-term memory; how we control, monitor, and enhance memory; individual differences in mnemonic ability; and the processes of retrieval and retention, including eye-witness testimony, and training and instruction. Upper undergraduate and graduate students, along with academics and researchers, in the area of cognitive psychology and related disciplines. The Board of Scientific Affairs (BSA) has just named Robert Bjork and three others as 1998 APA Distinguished Scientist Lecturers. Bjork is also editor of Psychological Review, recipient of UCLA's Distinguished Teaching Award, and president-elect of the Western Psychological Association.